There are now reports troops have taken the capital’s airport, which has been closed since 2014 – although these are disputed. In a tweet, Mr Guterres said he left Libya “with a heavy heart and deeply concerned”, saying he still hoped there was a way to avoid a battle around the capital. “We strongly oppose any military action in Libya,” the statement read, reiterating their support for UN-led efforts to bring elections and calling on all countries to support the “sustainable stabilisation of Libya”. The UN Security Council held a close-door meeting late on Friday. Afterwards the German UN ambassador Christoph Heusgen said members had “called on LNA forces to halt all military movements”. “There can be no military solution to the conflict,” he said. A Russian spokesman earlier told reporters the Kremlin does not support Gen Haftar’s advance and said it wants a solution by “peaceful political means”. A conference was planned in Libya later this month for talks over ending the country’s long-running crisis. Khalifa Haftar’s forces have met with mixed fortunes. British passports are being issued without the words ‘European Union’ on the cover, despite the delay to Brexit. The new burgundy passports were introduced from 30 March, the day after the UK was supposed to leave the EU, but some people may still receive the old version until stocks run out. One recipient said she was “truly appalled” at the change. Dark blue passports resembling the pre-EU British design are due to be issued from the end of the year. Susan Hindle Barone, who received her new passport on Friday, told the Press Association she thought the design should not change for as long as the UK remains an EU member. She said: “I was just surprised – we’re still members of the EU. I was surprised they’ve made the change when we haven’t left, and it’s a tangible mark of something which I believe to be completely futile. A change in the design of the UK passport has proved a rallying point for Brexit supporters, with former UKIP leader Nigel Farage describing the 2017 decision to bring back the dark blue design as “Brexmas”. The decision to remove the ‘European Union’ label was made in the expectation that the UK would be leaving the EU at the end of last month, as scheduled. A Home Office spokeswoman said that “in order to use leftover stock and achieve best value to the taxpayer”, passports that include the words “European Union” will continue to be issued for “a short period”. A posthumous new track from Avicii called SOS will be released on Wednesday 10 April, his family says. The Swedish DJ – whose real name was Tim Bergling – was found dead in Oman in April last year, aged 28. Now a 16-track album of new material entitled Tim, which “he was close to completing”, will follow on 6 June. Proceeds from the LP will go to Tim Bergling Foundation, set up after his death to help prevent mental illness and suicide. “When Tim Bergling passed away on April 20, 2018,” a family statement read, “he was close to completing a new album. “He left behind a collection of nearly finished songs, along with notes, email conversations and text messages about the music. The statement comes with a moving video, featuring Avicii in the studio and tributes from his family, and you can watch it below. 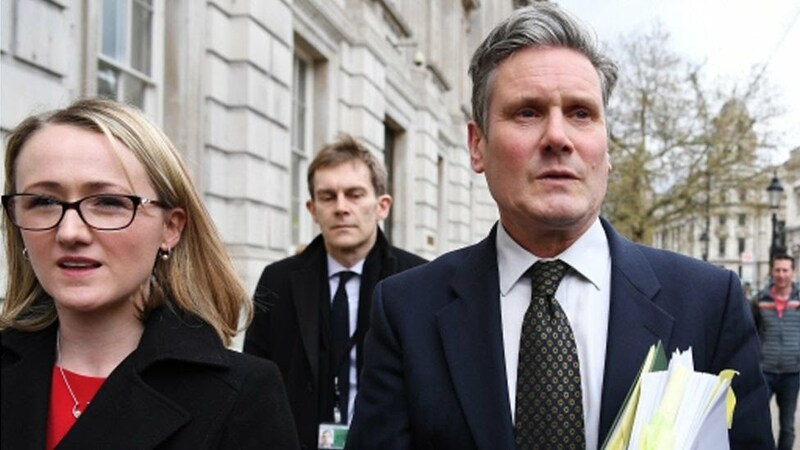 The government has not proposed any changes to the PM’s Brexit deal during cross-party talks, says shadow Brexit secretary Sir Keir Starmer. Meetings have been taking place between Tory and Labour politicians to find a proposal to put to the Commons before an emergency EU summit next week. But Sir Keir said the government was not “countenancing any change” on the wording of the existing plan. Theresa May has written to European Council President Donald Tusk to request an extension to 30 June. But she says if the Commons agrees a deal in time, the UK should be able to leave before European parliamentary elections on 23 May. Prisons Minister Rory Stewart told BBC Radio 4’s PM programme that there were “tensions” but there was “quite a lot of life” left in the talks with Labour. He insisted that “of course we are prepared to compromise” on the political declaration. She added that both sides agree the talks are not yet over, but there are no firm commitments for when further discussions might take place. It comes as the prime minister is seeking a further extension to the Brexit deadline from the EU, delaying the UK’s leaving date until 30 June. She said the UK would prepare to field candidates in European Parliamentary elections on 23 May in case no agreement is reached by then. The BBC’s Europe editor Mr Ben Rory has been told by a senior EU source that European Council President Donald Tusk will propose a 12-month “flexible” extension to Brexit, with the option of cutting it short if the UK Parliament ratifies a deal. But French President Emmanuel Macron’s office said on Friday that it was “premature” to consider another delay. A family of eight who died after their car plunged off a California cliff were killed in a “murder-suicide”, the state’s coroner’s office has ruled. The Mendocino County Sheriff-Coroner made the statement after a two-day inquest into the tragic 2018 deaths. The parents had researched suicide online before the crash, officials say. The crash, which killed six adopted children ages 12 to 19, came days after an inquiry was opened into allegations of child abuse against the parents. Sheriff-Coroner Thomas Allman explained that a 14-panel jury had ruled unanimously that the two women – Sarah and Jennifer Hart – deliberately drove off a 100ft (30m) cliff with their children in tow. Investigators say the couple, who had been living in Washington state, had researched methods of suicide on the internet for hours as they drove the family south along the northern California coast. Sarah Hart, and several of the children, were found to have Benadryl – an allergy drug that causes drowsiness – in their bodies at the time of the crash. The driver, Jennifer Hart, was over the legal limit for alcohol at the time, California Highway Patrol investigator Jake Slates said, according to the Associated Press. 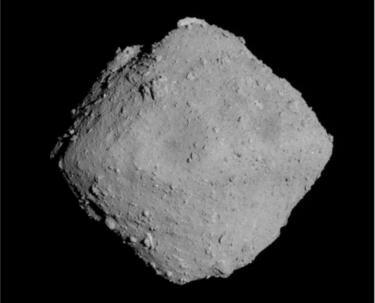 A witness who was camping nearby at the time told the jury that he heard a car engine revving up and screeching out around 03:00 local time (10:00 GMT) on 26 March. Investigators had suspected the act had been deliberate, based on the car’s computer and the lack of braking skidmarks in the road, which would have indicated an accident. 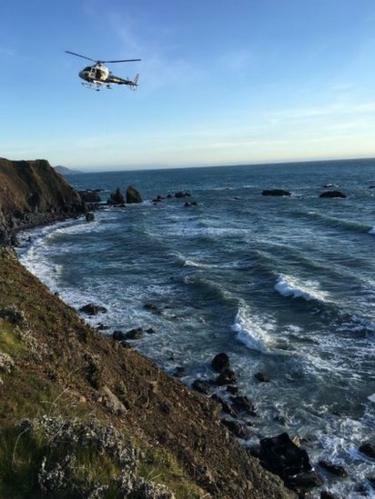 The bodies of five of the children – Markis, 19; Hannah, 16; Jeremiah, 14; Abigail, 14; and Ciera, 12 – were found within or nearby to the vehicle, which landed upside down on a Pacific Ocean beach. Devonte, 15, is still considered missing but is presumed dead. Investigators found the that the couple had been accused of child abuse several times, and that days before the crash officials in Washington state had opened an investigation after Devonte rang a neighbours’ doorbell and said his parents were withholding food. In 2010, Sarah Hart admitted to harming her daughter Abigail and was convicted of misdemeanour domestic assault. Donald Trump has stepped up his attacks on the US Federal Reserve by calling for the central bank to cut interest rates. The US President claimed that the Fed has “really slowed us down” in terms of economic growth, adding that “there’s no inflation”. Mr Trump made the comments as data showed a sharp rebound in new jobs growth during March. US firms added 196,000 jobs last month, compared to 33,000 in February. 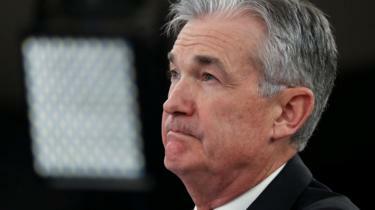 The Fed has raised interest rates four times since Jerome Powell took over as chairman in February last year. Mr Powell was appointed by Mr Trump but the president has frequently criticised the Fed chairman for increasing rates. The Fed had been forecast to raise interest rates a further two times this year. However, it has since said it is now taking a “patient approach” to interest rates. Last month, it indicated that it did not expect to raise interest rates for the rest of 2019. Mr Trump said earlier this week that he would nominate the former boss of Godfather’s Pizza to the Fed’s board of governors. Herman Cain, 73, ran to be the Republican presidential nominee in 2012 and is a former chairman of the Federal Reserve Bank of Kansas City. Along with Mr Cain, Mr Trump also intends to nominate Stephen Moore, who advised the president during his election campaign, to join the Fed’s board of governors. With his picks of Herman Cain and Stephen Moore to the Federal Reserve’s Board of Governors, Donald Trump appears to be politicising America’s central bank. Their candidacy marks a shift from the president’s first few nominees to America’s central bank. They were more traditional candidates and were more or less greeted with bipartisan approval. By contrast, Cain and Moore appear to have been picked less for their experience and more for their loyalty to the President and have therefore provoked a great deal of political criticism. Donald Trump has been openly critical of recent Fed policy, heckling Fed Chairman Jerome Powell on Twitter. The President favours lower interest rates and switching from quantitative tightening to quantitative easing. Economist Stephen Moore has been openly critical of the Fed. While Herman Cain, the former boss of Godfather’s Pizza and who has worked at the Kansas City Federal Reserve has often stated his anachronistic view that the US should return to the gold standard. If their nominations go through, they would be in a position to promote his view that the economy can grow much faster without overheating. For investors, it would raise fears about the independence of America’s central bank. While new jobs figures for March beat forecasts – analysts had been expecting growth of between 170,000 and 180,000 roles – earnings data showed that the annual rate of wage increases slowed to 3.2% in March, down from 3.4% in February. Ian Shepherdson, chief economist at Pantheon Macroeconomics, said: “Overall, these data won’t change anyone’s mind about whether the Fed ultimately will have to hike this year. Win Thin, global head of currency strategy at Brown Brothers Harriman, said it was a “mixed report” with highlights including an upwards revision to the 20,000 new jobs initially reported in February. 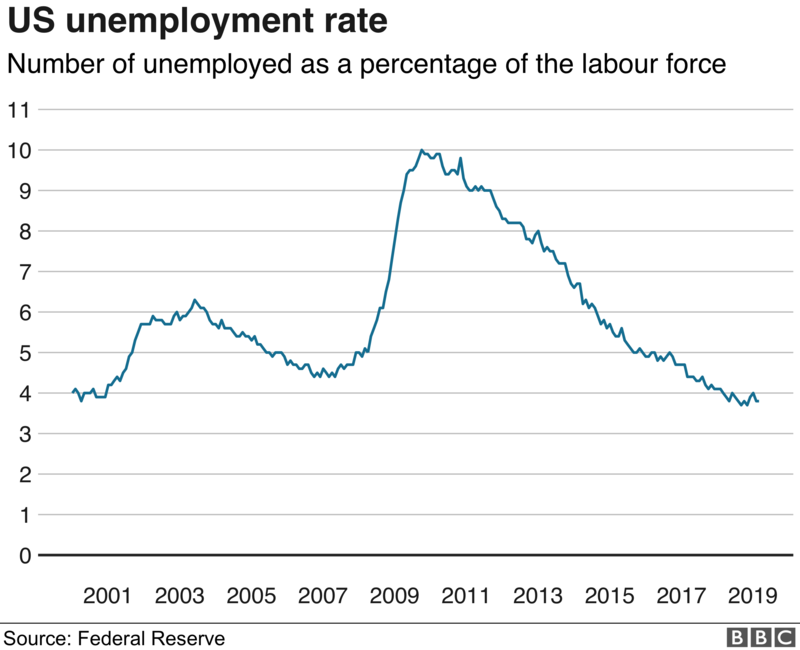 The unemployment rate remained at 3.8% for a second month. The healthcare sector saw jobs rise, but the retail and manufacturing sectors both saw declines. Some 6,000 jobs were lost in manufacturing, the first decline in the sector since July 2017. Car companies have been cutting thousands of jobs, including General Motors which is cutting about 14,000 workers. 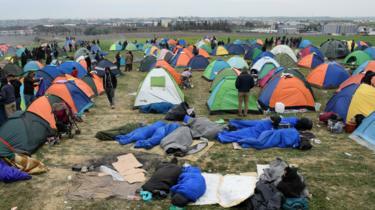 Greek police have scuffled with hundreds of migrants who gathered near the northern city of Thessaloniki hoping to enter North Macedonia. The Greek newspaper Kathimerini says dozens of migrants are protesting on the tracks at Athens’s Larissa station, forcing a suspension of rail services. Greek media describe as “fake news” the Facebook story about plans for an organised crossing of the North Macedonia border. Speaking to the BBC by phone, a Kurdish migrant from Iraq, 25-year-old Bilal Jaf, said “the situation is tense in Diavata camp now – we’re afraid that the police will try to evacuate our makeshift camp. Karzan Abdullah, 24, also an Iraqi Kurd, said: “I live in Greece for 12 months – I have to go on in Europe, because there is no life here anymore. In that crisis Germany took in more than 800,000 asylum seekers – an issue that remains very controversial. International law grants a right of asylum for refugees fleeing war or persecution. Thousands have taken to the streets of the Algerian capital demanding a complete overhaul of the country’s political structure. This is the seventh successive week of Friday protests and Tuesday’s resignation of long-serving President Abdelaziz Bouteflika does not appear to have satisfied the demonstrators. According to the constitution, parliament’s speaker should take over. 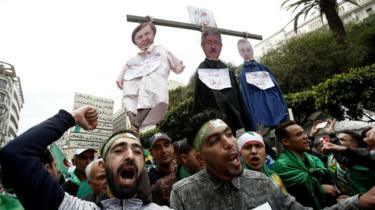 But protesters want all those associated with Mr Bouteflika to go. The president, who had been in power for 20 years, said this week that he was “proud” of his contributions but realised he had “failed in [his] duty”. He added that he was “leaving the political stage with neither sadness nor fear” for Algeria’s future. The youth are the main driving force behind these demonstrations, young men and women who have known no president other than Abdelaziz Bouteflika. But they are not satisfied. “We are tired of this regime, they have robbed us. We’ve had enough of that,” an emotional young woman tells me. Nearly half of the population is under 30, many of whom are unemployed and having to live in poor conditions. 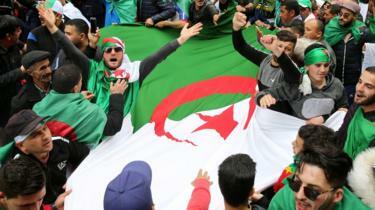 But I have also seen Algerians from older generations taking part in the protests. Everybody here wants a change. They are sending a clear message: “a new phase with new faces”. They tell me they don’t trust anyone associated with the Bouteflika era. The mood is full of enthusiasm and energy but the people here take pride in the peaceful nature of the protests. They have been emboldened by their success in unseating the president and now believe the same can happen with his entourage. How did the protests come about? The octogenarian leader suffered a stroke six years ago and has rarely been in public since. 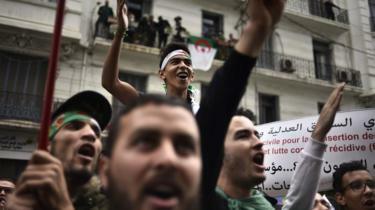 Mr Bouteflika resigned on Tuesday but that was not enough for protesters. 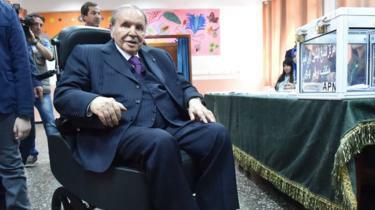 Who is former President Bouteflika? He is a veteran of Algeria’s war of independence who served as foreign minister for more than a decade before becoming president in 1999. His primary task was to rebuild the country, and its economy – but first, he needed to end Algeria’s brutal civil war sparked by the military’s refusal to recognise the election victory of the Islamic Salvation Front in the early 1990s. Despite guaranteeing stability in the oil-rich nation, his government has been accused of widespread corruption and state repression. The man who once said he would not accept being “three-quarters a president” spent his last years in a wheelchair after a stroke in 2013, rarely appearing in public, and fuelling fierce debate over who was really in charge, the BBC’s North Africa correspondent, Best, says. Who is officially running the country now? A caretaker government is currently in place. The president has resigned. What more do the protesters want? The demonstrators are pushing for the removal of three people they dub the “3B”. That is Senate Speaker Abdelakder Bensalah, head of the constitutional council Tayeb Belaiz and Prime Minister Noureddine Bedoui. But they want much more than that – they want to dismantle the whole political system. They say that the country is actually run by a group of businessmen, politicians and military officials who used Mr Bouteflika as a front. They want to take the power away from this group, known as Le Pouvoir. Specifically, one of the leading voices of the protest movement, lawyer Mustapha Bouchachi, told AFP news agency that he doesn’t want the “symbols of the regime” to run the next election. Who else has lost their position of power so far? Earlier on Friday, the head of intelligence and close ally of Mr Bouteflika, Athmane Tartag, was reportedly sacked. He was a close ally of Mr Bouteflika. The BBC’s Europe editor Mr Ben Rory has been told by a senior EU source that European Council President Donald Tusk will propose a 12-month “flexible” extension to Brexit, with the option of cutting it short, if the UK Parliament ratifies a deal. But French President Emmanuel Macron’s office said on Friday that it was “premature” to consider another delay while French diplomatic sources described Mr Tusk’s suggestion as a “clumsy test balloon”. The prime minister wrote to Mr Tusk to request the extension ahead of an EU summit on 10 April, where EU leaders would have to unanimously agree on any plan to delay the UK’s departure. Instead, she was offered a short delay to 12 April – the date by which the UK must say whether it intends to take part in the European Parliamentary elections – or until 22 May, if UK MPs had approved the withdrawal deal negotiated with the EU. They voted it down for a third time last week. A Downing Street spokesman said there were “different circumstances now” and the prime minister “has been clear she is seeking a short extension”. It’s the day before the new European Parliament will hold its first session. So the logic is, that it would allow the UK a bit longer to seal a deal – but without the need for British MEPs to take their seats in a parliament that the UK electorate had voted to leave as long ago as 2016. But, this being Theresa May, it’s a plan she has previously proposed – and which has already been rejected. It’s likely the EU will reject it again and offer a longer extension, with the ability to leave earlier if Parliament agrees a deal. But by asking for a relatively short extension – even if she is unsuccessful – the prime minister will be hoping to escape the ire of some of her Brexit-supporting backbenchers who are champing at the bit to leave. And she will try to signal to Leave-supporting voters that her choice is to get out of the EU as soon as is practicable – and that a longer extension will be something that is forced upon her, rather than something which she embraces. In her letter, the prime minister says she would continue to seek the “rapid approval” of the withdrawal agreement and a “shared vision” for the future relationship between the UK and EU. She said if cross-party talks with the Labour Party could not establish “a single unified approach” in the UK Parliament – MPs would be asked to vote on a series of Brexit options instead which the government “stands ready to abide by”, if Labour commits to doing the same. The UK proposes an extension to the process until 30 June, she wrote, and “accepts the European Council’s view that if the United Kingdom were still a member state of the European Union on 23 May 2019, it would be under a legal obligation to hold the elections”. To this end, she says the UK is “undertaking the lawful and responsible preparations for this contingency”. The EU’s chief Brexit negotiator Michel Barnier, at a meeting of EU ambassadors in Brussels, said any extension granted should be the last and final offer, to maintain the EU’s credibility. Donald Tusk believes he has hit on a compromise solution: his “flextension” which would last a year, with the UK able to walk away from it, as soon as Parliament ratifies the Brexit deal. Expect closed-door political fireworks – though it’s unclear whether it’ll be a modest display or an all-out extravaganza – at their emergency Brexit summit next week. Under EU law, they have to hammer out a unanimous position. Speaking to Labour activists in Newport on Friday, Mr Corbyn said the government “haven’t appeared to have changed their opinions very much as yet”. He said Labour would push to maintain the UK’s “market relationship with Europe”, including defending rights and regulations. Foreign Secretary Jeremy Hunt said the UK still hoped to leave “in the next couple of months” but it may have “little choice” but to accept a longer delay if Parliament could not agree a solution. But Conservative Brexiteer Jacob Rees-Mogg said the EU “should be careful what it wishes for”. “If we have EU elections, it is likely UKIP, Tommy Robinson and Nigel Farage will do well,” he told BBC Radio 4’s World at One. Another Tory Eurosceptic, Sir Bernard Jenkin, said he would prefer to stay in the EU for another year than for Britain to accept a “humiliating defeat” of a withdrawal agreement. The Scottish National Party’s Stephen Gethins said that the prime minister’s proposal “demonstrates beyond doubt she is putting the interests of her fractured Tory Party above all else”. European stereotype depictions tend to portray Germans as lacking a sense of humour. But in political cartoons and on satire shows like Extra 3, Germany is finding plenty to laugh about Brexit. “Fisch und Tschüss” is a slogan for the satirical news programme, The Heute [today] Show – a play on words for the traditional UK dish, fish and chips. Except Tschüss in German means goodbye. After initially mourning the UK’s vote to leave, then following every twist and turn of negotiations for a while, many Germans now feel alienated from the process. They can’t keep up with what’s going on in the House of Commons. “Brexit has been a strain on all of us. 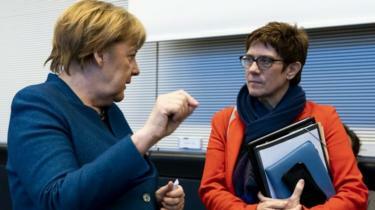 In some ways it has paralysed us,” Annegret Kramp-Karrenbauer told me in Berlin in a UK exclusive interview. She’s the leader of Germany’s CDU party, very close to Angela Merkel and widely tipped to be the next German chancellor. Ms Kramp-Karrenbauer – also known as AKK – is far from detached when it comes to Brexit. She and a number of other German politicians penned a letter to the Times newspaper back in January, appealing to the UK to change its mind. Now, the EU’s determined attempt to show unity at all times over Brexit means it has been frustratingly difficult to get EU leaders to agree to in-depth, on-the-record Brexit interviews . But AKK is not the German chancellor. She had no qualms about laying bare her Brexit regret. “Anything that keeps the UK close to the EU and best of all, in the EU, would make me personally very happy” she told me. She hopes for a second referendum – but only, she said, if the majority of UK citizens felt it would heal the country rather than exacerbate divisions further. With the deadline for a Brexit decision looming next week on 12 April, Ms Kramp-Karrenbauer believes the risk of the UK leaving without a deal have “risen dramatically”. This is something German business find no laughing matter. A recent poll suggested 100,000 German jobs could be affected by a no-deal Brexit. The BDI Federation of German Industry warned Germany would lose at least 0.5% of its GDP – and this at a time when the German economy is already heading south. That, I think, is why there is a sudden, noticeable softening in tone when EU leaders speak about Brexit. At a press conference in Dublin on Thursday, Chancellor Merkel struck a determinedly encouraging note. Peering into the abyss of a no-deal Brexit over the last few days, EU leaders have had a short, sharp reality check. What impact would that have on them and their countries, they wonder? And what are they be prepared to do to avoid it? There is no common EU position on this yet. That’s putting it politely. Verbal fisticuffs are predicted at next week’s emergency Brexit summit when the 27 EU leaders come face-to-face. The man who represents all of them here in Brussels, President of the European Council Donald Tusk, thinks he may have found a solution. However, it doesn’t exactly roll off the tongue. He’s proposing what he calls a “flextension”, which could see the UK signing up to a one-year-long Brexit delay with the option to cut it short as soon as parliament ratified the Brexit deal. Mr Tusk believes the arrangement would suit the EU and the UK – and as one EU official put it to me, it would avoid Brussels potentially being faced with “endless” UK requests for repeated short extensions every few weeks. EU leaders will discuss Mr Tusk’s proposal at next Wednesday’s summit. By law, their decision must be unanimous. Annegret Kramp-Karrenbauer suggested something else the EU could do: take another look at the controversial backstop guarantee to keep the Irish border open after Brexit. Far from official EU Brexit policy, but it gives us a taster of the kind of conversations going on behind closed EU political doors. Jussie Smollett will be sued by the City of Chicago after “refusing to reimburse” the cost of investigating an alleged assault on him in the city. Prosecutors say a homophobic and racist attack was staged to boost the actor’s career, but Smollett has always maintained his innocence. The 36-year-old was given seven days to pay $130,000 (£99,000) to cover the investigation’s cost. The deadline passed on Thursday and now a civil complaint will be filed. The City of Chicago’s law department said it will “pursue the full measure of damages allowed”, adding in a statement that the lawsuit will be filed “in the near future”. After initially being treated as a victim Smollett was accused of staging the attack and became the subject of the police investigation, but the charges against the actor were dropped last week. The charges were dropped because Smollett forfeited a $10,000 (£7,600) bond payment and carried out community service, according to Illinois prosecutor Joe Magats. Chicago Mayor Rahm Emmanuel called it a “a whitewash of justice” and claimed Smollett had dragged the city’s reputation “through the mud”. 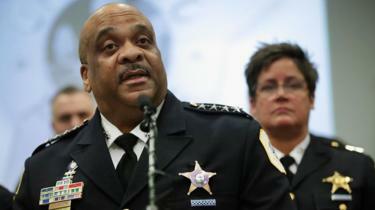 In the initial letter demanding $130,000, which includes overtime hours police used on the case, the City of Chicago said: “As part of the investigation, Chicago police reviewed video and physical evidence and conducted several interviews, expending resources that could have been used for other investigations. A new Mayor of Chicago, Lori Lightfoot, was elected on Wednesday and will be sworn in on 20 May. She told MSNBC following her victory that there needs to be a “much more fulsome explanation” as to why the charges against Smollett were dropped. Newsbeat has contacted representatives for Jussie Smollett for comment. A German politician could become an “absolutely controlled” MP in the Bundestag, according to Russian documents. The politician, Markus Frohnmaier, is a member of the German parliament from the far-right AfD party. The documents date back to April 2017, when Mr Frohnmaier was a candidate for election to the Bundestag. He was subsequently elected in September 2017. Mr Frohnmaier told the BBC he had no knowledge of the documents. The AfD (Alternative for Germany) is now the main opposition party in the German Parliament. Mr Frohnmaier has frequently spoken out against EU sanctions on Russia, and made trips to Crimea, the Ukrainian territory annexed by Russia in 2014, as well as parts of eastern Ukraine controlled by pro-Russian separatists. The documents were obtained by the Dossier Centre, an organisation that aims to investigate Kremlin attempts to influence politicians abroad. The Dossier Centre is funded by Mikhail Khodorkovsky, a former Russian oligarch, an opponent of President Vladimir Putin who spent nearly 10 years in jail in Russia. The BBC conducted a joint investigation into the documents together with the German magazine Der Spiegel, the German TV channel ZDF and the Italian newspaper La Repubblica. The documents provide an insight into so-called “active measures” – Russian attempts to influence Western politics. The main document, written in Russian, appears to be a strategy paper detailing general attempts to influence public opinion and decision-makers across the EU on topics such as Crimea, Ukraine and EU sanctions against Russia. But right at the end, there is something more specific. Under the heading “elections to the Bundestag”, the document names one candidate: Markus Frohnmaier. 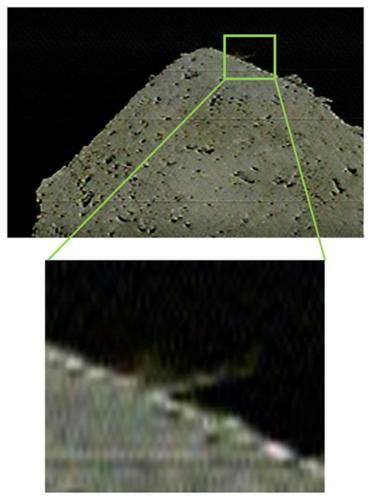 The document was attached in an email, also seen by the BBC. The email was sent by Petr Premyak, a former naval counterintelligence officer and a former member of the upper house of the Russian parliament. Mr Premyak confirmed to a reporter from ZDF that he wrote the email, but said he was not the author of the attached strategy document. The recipient was Sergei Sokolov – a senior official in President Putin’s administration. It is not clear whether the Kremlin acted on the recommendations in the document, and there is no evidence that Russia provided any “material support” to Mr Frohnmaier’s campaign. Separately, the BBC obtained another document, also from April 2017, that appears to be a request for help written on behalf of Mr Frohnmaier’s campaign. This document is written in occasionally faulty English, and is entitled: “Frohnmaier election campaign/action plan (draft)”. “For the election campaign we urgently would need some support,” the letter states. And if elected, Mr Frohmaier would “immediately start operating in the foreign policy field”. Mr Frohnmaier told the BBC he had no knowledge of the Russian document obtained by the Dossier Centre, nor of document apparently written on behalf of his campaign. “I think that’s a fake document,” he said. Asked whether he could explain how the authors of the Russian document came to the conclusion that he would be an “absolutely controlled MP”, Mr Frohnmaier said, in a statement from his lawyers: “Our client emphasises that he was never under the control of any third party. The world’s richest man, Amazon founder Jeff Bezos, and his wife MacKenzie have agreed a record-breaking divorce settlement of at least $35bn (£27bn). The Amazon shares alone will make Ms Bezos the world’s third-richest woman while Jeff will remain the world’s richest person, according to Forbes. Ms Bezos’ tweet is her first and only one since joining the microblogging website this month. In it she stated that she was “grateful to have finished the process of dissolving my marriage to Jeff with support from each other”. She will also give up her interests in the Washington Post newspaper and Mr Bezos’ space travel firm Blue Origin. Ms Bezos is a successful novelist who has written two books, The Testing of Luther Albright and Traps. She was taught by Pulitzer Prize-winning author Toni Morrison at Princeton University, who once said of her pupil that she was “one of the best students I’ve ever had in my creative-writing classes… really one of the best”. South Korea has declared a national emergency in response to one of the largest wildfires on record. At least one person has died and more than 4,000 people have been evacuated. Thousands of soldiers have been helping firefighters from across South Korea extinguish the flames in the country’s north-eastern mountainous region, close to the border with North Korea. 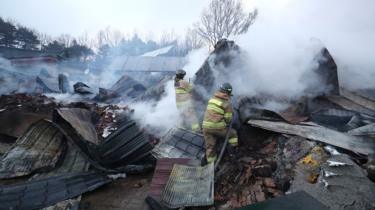 Although the main fire has been brought under control, others are still burning, officials say. It is believed the fire, which broke out late on Thursday, originated from a spark at a transformer near Goseong in Gangwon Province, north-east of Seoul. Fanned by strong winds, it quickly spread through the mountain region which hosted the Winter Olympics last year, and to the cities of Sokcho and Gangneung, officials say. More than 800 fire engines were brought in from across South Korea to help tackle the fire. 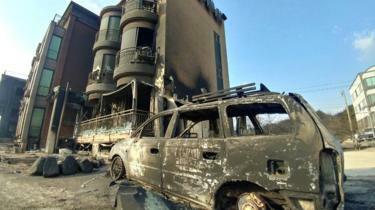 The blaze has destroyed several hundred buildings in the province. President Moon Jae-in held an emergency meeting and called for officials to deploy all available resources. Some 16,500 soldiers, 32 military helicopters and 26 military fire trucks have been deployed, the ministry of defence said. “Fortunately, the main fire has been brought under control,” provincial governor Choi Moon-soon said in a radio interview with news broadcaster YTN, but added that others were still burning. The fire in the Sokcho region has been contained, the government said, while about 50% of the fire in the Gangneung region has been contained. The last time a disaster of a similar scale hit South Korea was in 2007, when a crude oil carrier leaked thousands of tonnes of oil into the sea off the west coast. The leader of forces in eastern Libya has ordered them to march on the capital Tripoli, the base of the internationally recognised government. Khalifa Haftar’s order to the self-styled Libyan National Army came as UN chief Antonio Guterres was in Tripoli. 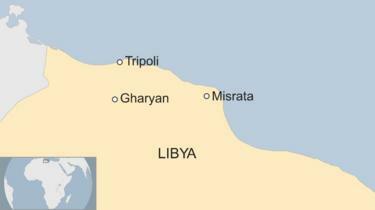 Armed groups from the western city of Misrata, which back the government, have vowed to stop any advance. Mr Guterres, the US and European nations have all called for calm. Speaking to reporters in Tripoli, Mr Guterres said he was making a “strong appeal to stop… the escalation”. The UN Security Council will meet on Friday to discuss the situation following a request from the UK, reports said. The US, UK, France, Italy and the United Arab Emirates (UAE) issued a joint statement appealing for calm. “At this sensitive moment in Libya’s transition, military posturing and threats of unilateral action only risk propelling Libya back toward chaos,” the statement, issued by the US state department, said. 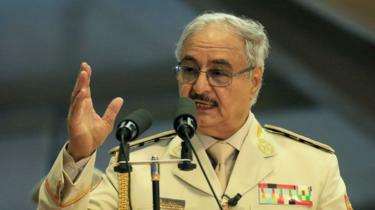 “We strongly believe that there is no military solution to the Libya conflict,” the governments added. The UN had been planning to hold a conference in Libya later this month for talks over ending the country’s long-running crisis. What is happening on the ground? After Gen Haftar’s announcement, his forces moved towards the capital from several directions, one of his spokesmen said. There were conflicting reports that Gen Haftar’s forces had entered the town of Gharyan, 100km (60 miles) south of Tripoli. The Libyan National Army (LNA) says it has secured Gharyan and moved on. However it said two of its soldiers had been wounded in clashes in a nearby area. A Gharyan official told AFP that there were “ongoing efforts to avoid a confrontation” between rival fighters in the town. Meanwhile residents in Misrata said armed groups from the city had begun moving towards the Libyan capital, Reuters reported. The offensive comes after Gen Haftar’s forces seized parts of the south of the country earlier in the year. A former army officer, he helped Colonel Gaddafi seize power in 1969 before falling out with him and going into exile in the US. He returned in 2011 after the uprising against Gaddafi began and became a rebel commander. In December Gen Haftar met Prime Minister Fayez al-Serraj from the UN-backed government at a conference but refused to attend official talks. Gen Haftar has received backing from Egypt and the UAE, who see him as tough on Islamists. European Council President Donald Tusk is proposing to offer the UK a 12-month “flexible” extension to its Brexit date, according to a senior EU source. His plan, which would need to be agreed by EU leaders at a summit next week, would allow the UK to leave sooner if Parliament ratifies a deal. The UK’s Conservatives and Labour Party are set to continue Brexit talks later. Theresa May will write to Mr Tusk with the UK’s request for a further delay to Brexit, it is understood. The UK is due to leave the EU on 12 April and, as yet, no withdrawal deal has been approved by MPs. Attorney General Geoffrey Cox has told the BBC that if they fail, the delay is “likely to be a long one”. Prime Minister Theresa May has said a further postponement to the Brexit date is needed if the UK is to avoid leaving the EU without a deal, a scenario both EU leaders and many British MPs believe would create problems for businesses and cause difficulties at ports. On Wednesday, MPs voted – by a majority of one – in favour of a backbench bill which would force Mrs May to ask the EU for a further extension. However, the PM wants to keep any delay as short as possible. To do that, she and Labour leader Jeremy Corbyn would need to agree a proposal for MPs to vote on before 10 April, when EU leaders are expected to consider any extension request at an emergency summit. If they cannot, Mrs May has said a number of options would be put to MPs “to determine which course to pursue”. Mr Cox told the BBC’s Political Thinking podcast that particular scenario would involve accepting whatever postponement the EU offered, which was likely to be “longer than just a few weeks or months”. But Conservative Brexiteer Sir Bernard Jenkin said the EU was “toying” with the UK and the PM was under no obligation to accept the terms of any extension, even if mandated to by MPs. 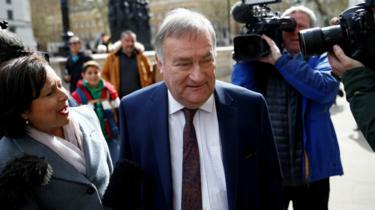 But he said an extension of a year or so would be better than leaving on the terms agreed by the PM, accusing her of being “pretty dishonest” about her willingness to countenance a no-deal exit. 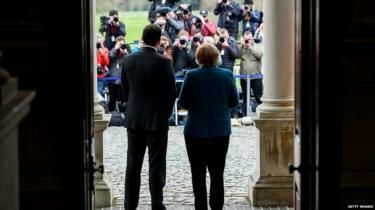 Europe’s leaders have been split over whether, and how, to grant any extension. However, BBC Europe editor Mr Ben Rory has been told by a senior EU official that Mr Tusk “believes he’s come up with an answer”, after several hours of meetings in preparation for the summit. President of the European Council Donald Tusk thinks he may have found a solution. Though it doesn’t exactly roll off the tongue. He’s proposing what he calls a “flextension” which could see the UK signing up to a one-year-long Brexit delay with the option to cut it short as soon as Parliament ratified the Brexit deal. Mr Tusk believes the arrangement would suit the EU and the UK – and as one EU official put it to me: it would avoid Brussels potentially being faced with “endless” UK requests for repeated short extensions every few weeks. EU leaders will discuss Mr Tusk’s proposal at their emergency Brexit summit next Wednesday. By law, their decision must be unanimous. The leader of Germany’s ruling Christian Democrat Union party, Annegret Kramp-Karrenbauer, suggested something else the EU could do: take another look at the controversial backstop guarantee to keep the border open after Brexit. 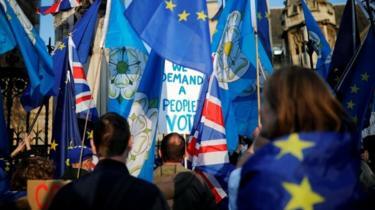 The EU has previously said that the UK must decide by 12 April whether it will stand candidates in May’s European Parliamentary elections, or else the option of a long extension to Brexit would become impossible. Talks between Conservative ministers and Labour lasted nearly five hours on Thursday. Mr Corbyn has written to his MPs saying discussions included customs arrangements, single market alignment, internal security, the need for legal underpinning to any agreements and a “confirmatory” vote. The main item of business in the last frantic 24 hours has been the cross-party talks between the Conservatives and the Labour Party. From both sides, it sounds like they are serious and genuine, and negotiators got into the guts of both their positions and technical details on Thursday. Remember, behind the scenes there isn’t as much difference between the two sides’ versions of Brexit as the hue and cry of Parliament implies. But the political, not the policy, distance between the two is plainly enormous. Shadow Treasury minister Clive Lewis told the BBC the party would not be talking to the government if a “confirmatory referendum” was not an option. But 25 Labour MPs – including a number representing Leave-voting seats – have written to Mr Corbyn, saying another referendum should not be included in any compromise Brexit deal. If the talks fail, the government faces an additional obstacle in the form of a backbench bill which would force the PM to seek a new delay. Passed by MPs by one vote on Wednesday, the bill is being scrutinised by the House of Lords, who will next consider the draft legislation on Monday. Ministers have argued it could increase “the risk of an accidental no-deal” in the event the EU agreed to an extension but argued for a different date than one specified by MPs. That would mean Mrs May having to bring the issue back to the Commons on 11 April, when European leaders would have returned home, the prime minister’s spokesman said. 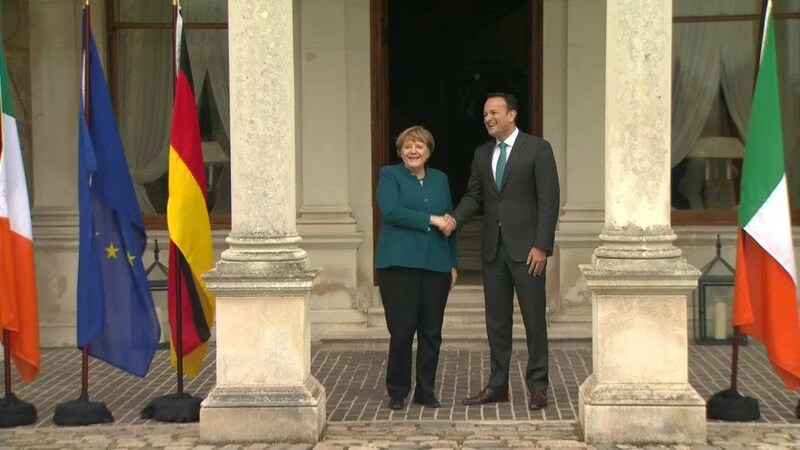 After a meeting with Irish Prime Minister Leo Varadkar in Dublin, German Chancellor Angela Merkel said her country still hoped for an “orderly Brexit”. “We will do everything in order to prevent… Britain crashing out of the European Union,” she said.